Canonical explains Ubuntu Advantage benefits -- could your business switch to Linux? Linux-based desktop operating systems are better than Windows because they are free, right? Whoa there, folks. Neither are necessarily better or worse -- it really depends on your needs. Cost-free operating systems, such as Ubuntu and Fedora, are definitely great for home consumers looking to breathe new life into old machines. With that said, the benefits of Linux extend beyond money and cost-savings. Linux being free is sort of misleading when it comes to business use too. While a small business with a few employees can sometimes get by without paying for support, larger companies would be crazy to go it entirely alone -- paid support is a necessity for success. 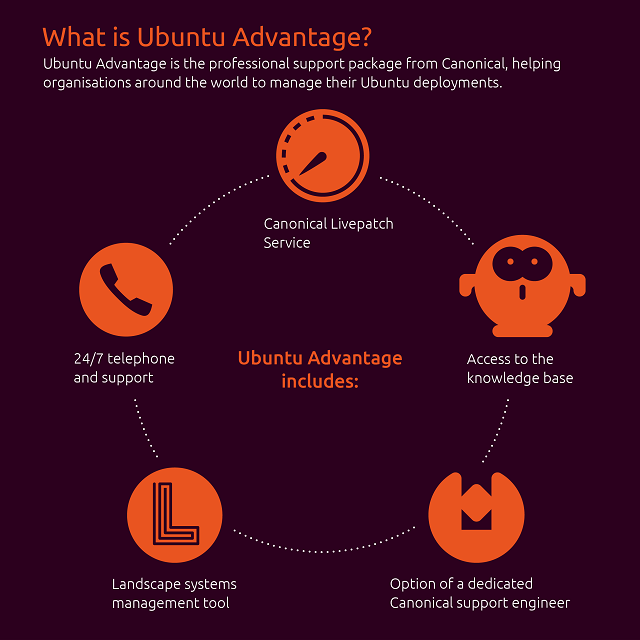 Today, Canonical releases a well-designed infographic that explains the benefits of its paid support, called 'Ubuntu Advantage'. "Ubuntu Advantage is the commercial support package from Canonical. It includes Landscape, the Ubuntu systems management tool, and the Canonical Livepatch Service, which enables you to apply kernel fixes without restarting your Ubuntu 16.04 LTS systems", says Canonical. The company further shares, "Ubuntu Advantage gives the world's largest enterprises the assurance they need to run mission-critical workloads such as enterprise databases, virtual/cloud hosts or infrastructural services on Ubuntu". You can see the full infographic below. Could you see your company leaving Windows for Ubuntu thanks to this paid support? Tell me in the comments.